Acumen has supported every stable Magento release since its launch. Store owners, developers, and design studios choose Acumen because it’s the best supported and most rigorously updated Magento theme available. Acumen 1.3.4 -- 2012-05-31 -- Magento 1.7.0.2 to 1.7.0.0 + 27 feature updates! Acumen 1.3.3 -- 2012-03-19 -- Snippets! Plus a massive number of optimizations! Acumen 1.3.1 -- 2011-12-26 -- UI Widgets! Big feature update! If your business counts on Magento, you can trust Acumen will always support the next update. We believe transparency. It usually takes 1-3 weeks from the time Magento announces a release until GravDept publishes a compatible update. Sometimes a release overlaps a vacation/holiday/conference and it takes a little longer. GravDept has never skipped a single Magento update since April 2010. 15 UI Widgets: create interactive content sliders, pop overs, featured product lists with ease. 15 Snippets: add content areas you can update from the Magento Admin with no coding! 960 Grid System: every template follows an orderly 12-column grid. 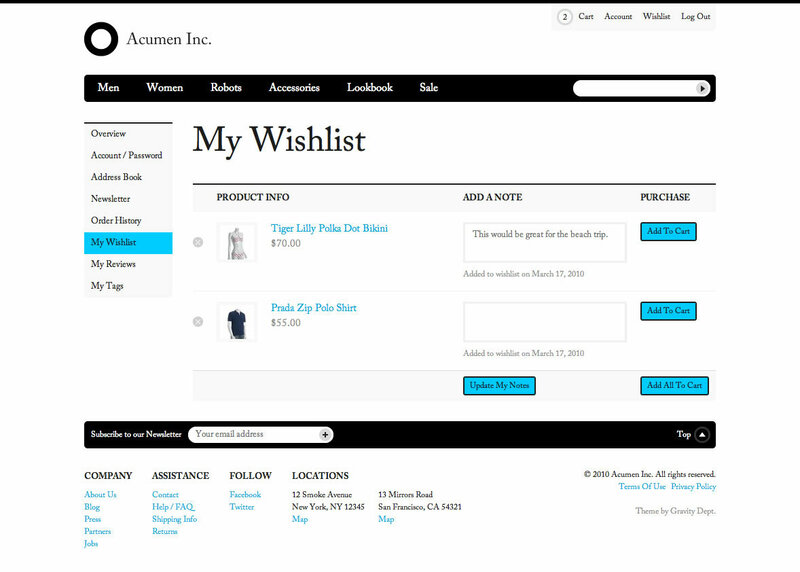 Language translation ready: 100% of Acumen’s templates use Magento’s translation methods. 10 Sliders: New Products + Featured Products + Large Promo + Grid Based. 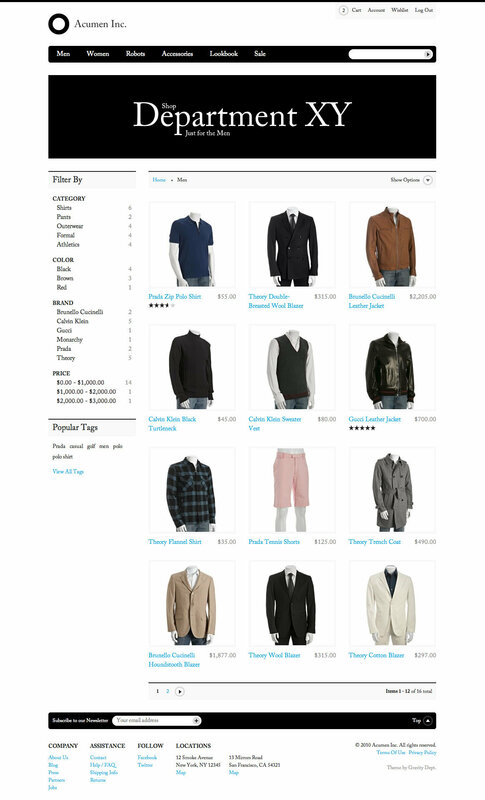 Mega Navigation Menu: show the full catalog structure easily. 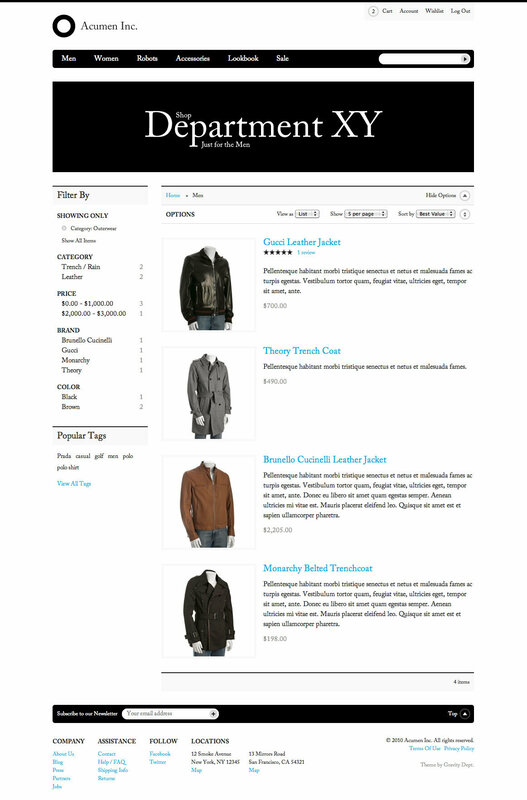 Mini-Cart Menu: users see the cart on every page. Designed for customizations: includes override.css for easy upgrades. Web font ready: primed for Google Web Fonts, Typekit, @font-face, etc. Need more details? The Acumen Tour has you covered. Explore every aspect of Acumen’s development and see why it’s the perfect starting point for your store. We focused on what matters: primary navigation, deep linking home page, manageable featured products, and seamless interaction. Still looking for color variations? 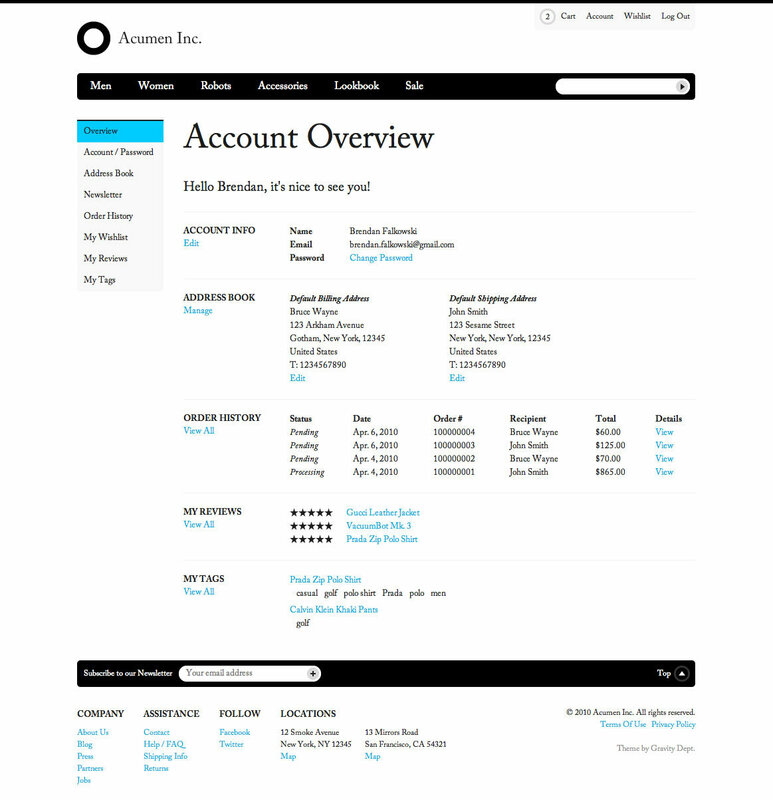 Acumen supports over 65,000 via CSS. Acumen’s intelligent features are so natural, you’ll have to pay attention to notice them. Acumen was made for clarity and organization. We shook up the visual hierarchy to highlight the most important information and removed the clutter. The result was beautiful catalog and product pages with prominent photography. 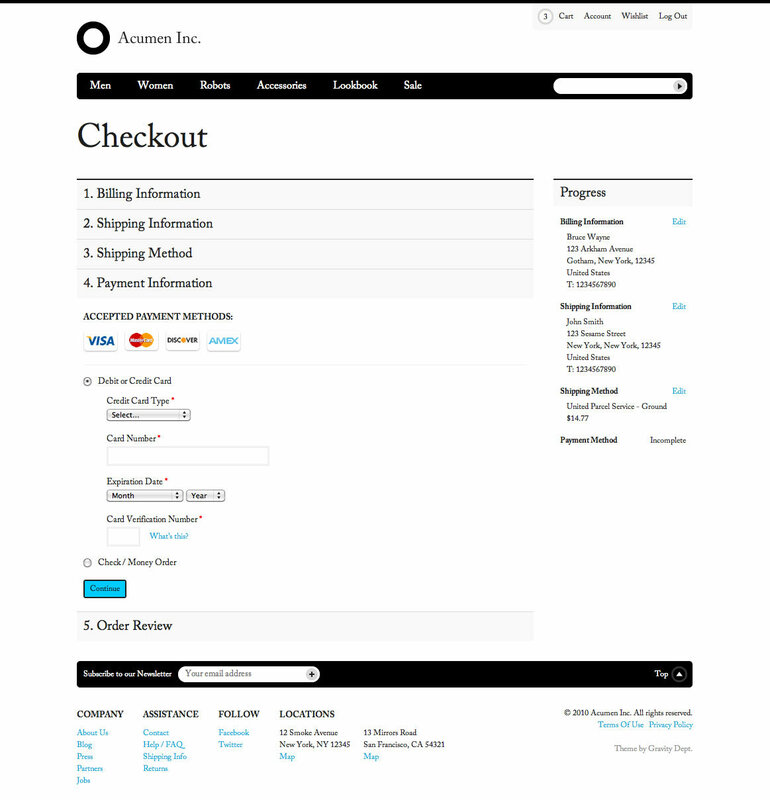 Both checkout modes were streamlined for simplicity. 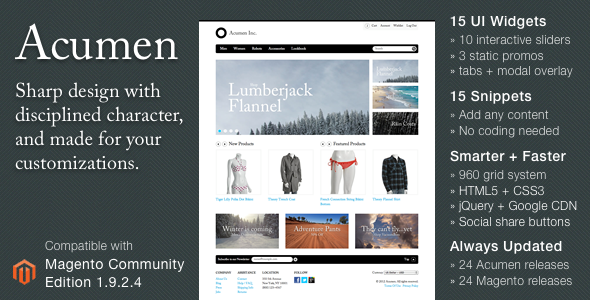 View Acumen’s clean layouts. While other themes claim to implement grids like 960.gs, they don’t. Look at the markup for proof. 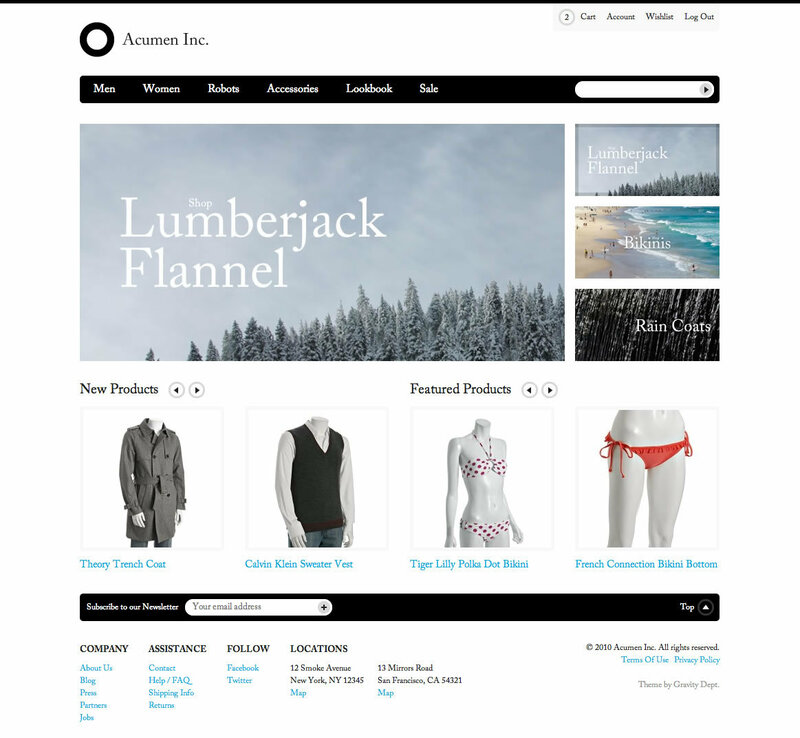 Every template in Acumen was stripped of Magento’s structural markup and replaced with our flexible grid. See Acumen’s grid framework. We followed Magento and Zend best practices when writing Acumen from theme fallback hierarchy to fully supporting multi-language translation. Every modification is annotated with comments, and the every frontend template’s markup was scrubbed for improved semantics and accessibility. That’s SEO gold. View our code practices. Acumen was a launch theme for the Magento category, and it has the most active development history. We’ve supported every stable Magento version with a full compatibility release (usually in ~1 week). Other themes are still multiple Magento versions behind. We’re streets ahead, view the changelog. Read through the comments. We answer every question and problem within 24 hours, often much faster than that. We don’t ignore customers or bugs, and include a comprehensive Magento/Acumen installation guide with suggestions for server selection and store configuration settings to help you go live. GravDept has sold hundreds of Magento themes, and seen Magento running in 40+ different server environments. We know from experience what works and what doesn’t. We recommend Nexcess hosting for Magento websites without hesitation. Each SIP (Secure Isolated Platform) is an entirely self-contained and fine-tuned eCommerce environment. They provide the most stable, secure, and scalable out-of-the-box Magento hosting solution. GravDept uses a Nexcess SIP-100 server to demo Acumen, and fully recommends Nexcess to clients. They have hosting plans to that scale to companies of all sizes.